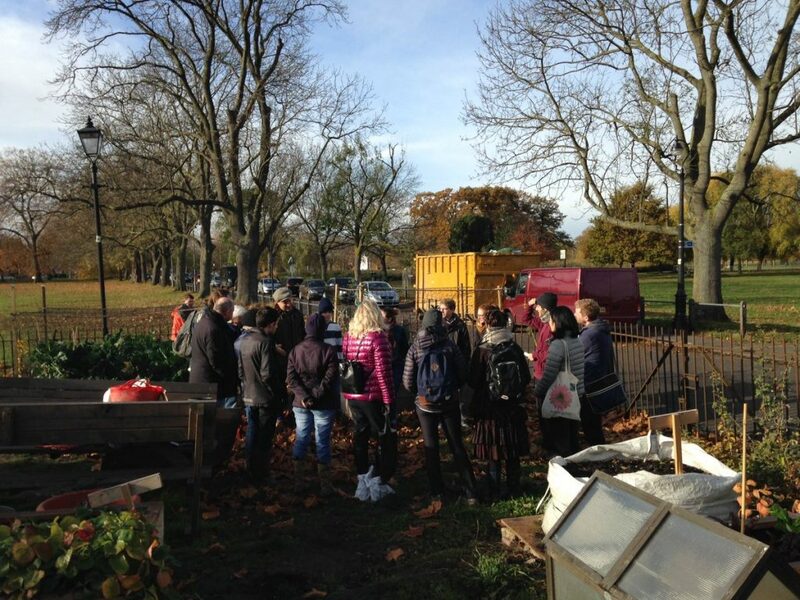 On Saturday 19 November, Michel from Social Landscapes led us in the final of three workshops hosted in Bandstand Beds community garden on Clapham Common. 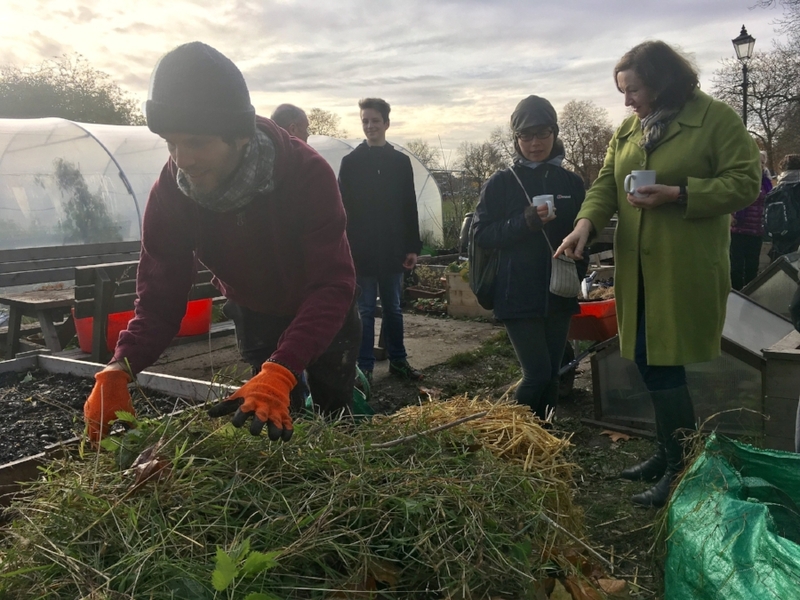 Over 20 enthusiastic gardeners from across London attended and learned about making compost heaps, worm composting and the different minerals and mineral ratios involved in generating healthy soil and compost. So what is healthy soil? Healthy soil is dark in colour, smells good, contains lots of organic matter and is rich in minerals. Michel spoke about the virtues of healthy soil and the negative effect that agriculture can have on it. Healthy soil has good drainage but allows for water and nutrient retention through organic matter and soil life, whereas soil that has been used for intensive agricultural practices becomes compressed and does not allow air in. When making compost it is essential that we encourage conditions where microorganisms can thrive. When making compost, think in brown and green. Brown often, but not exclusively signals that the material used for composting is high in carbon, while green materials such as nettle and grass, often, but not always signal that the component is high in Nitrogen. If you want to boost your crops or compost, try a scattering of mineral rich rock dust. Rock dust can be bought for around £15 and ordered here. If you want to get started making compost, try and create a compost heap that is 1m x 1m. If you really want to accelerate your compost heap then try and turn it every two days or so. And it important to note that the middle of your heap will generate the most heat so when turning your compost, turn it from the outside in. Another handy tip for creating good compost is to use already composted soil on your newly created compost heap as an inoculant. Use a squeeze test to check the moisture, if a drop slowly runs out then it is hydrated perfectly, if no moisture is released then your compost is too dry. Here, Bandstand Beds member Ollie, tells us what he thought of the morning: ‘I thoroughly enjoyed attending another excellent workshop at Bandstand Beds on Saturday. This week’s topic was Soil and Compost – the goldmine of any growing space. We felt and smelt several different soils before discussing the benefits of clay, sand and silt and how a combination of the three in the ratio of 20:40:40 combine to create a fertile loam. We also reminded ourselves of the importance of water, air and microorganisms in healthy soil. Apparently, there could be more microorganisms in a handful of soil than humans on the planet! ‘The rest of the workshop was dedicated to making compost. As a group we gathered a mixture of green (nitrogen rich) and brown (carbon rich) waste from around the garden. Our compost ingredients included leaf mould, straw, nettles, cardboard and freshly fallen leaves, which we put on top of each other in layers. The idea was to create a lasagne of brown on top of green, on top of brown, on top of green. Like the soil, a good compost requires air and water, so we soaked the pile of organic matter. Finally, a sprinkle of nutrient rich volcanic rock dust and the new compost heap was formed. ‘I found the discussion on the ideal chemical balance of our compost really useful. We should aim for a ratio of 30 to 1 carbon to nitrogen. For example, straw has a carbon nitrogen ratio of 90 to 1, chicken manure is about 7 to 1. Leaf mold and green waste are good for getting the compost reacting and generating heat. Comfrey leaves and plants with tap roots are rich in nutrients. And then there’s the benefit of peeing on the compost but perhaps, not to be encouraged in the middle of Clapham Common! Read Michel’s Know Your Compost article on the Social Landscapes website.